A few days back, Vivo launched another smartphone to expand their Z series. Vivo Z3 was launched on October 17 with Turbo technology that has the capability to boost the performance. After Vivo Z3 Launch, recently we came to know that Vivo is also working on another set of mid-range phones that will soon pop up in the leaks and renders. 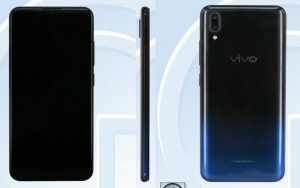 Three new Vivo phones appeared on TENAA revealed that the Chinese vendor is prepping up another release. TENAA listing revealed three upcoming Vivo devices. Two of them with model numbers V1818A, V1818T seem to have identical specs. So, it is expected that one of them may be aimed at a carrier. Furthermore, the phone will feature a 6.22-inch IPS display with 720 x 1520 (HD+) resolution. The phone will have a slightly thick chin. Moreover, it will have a waterdrop-styled notch that is quite common nowadays. The waterdrop notch is expected to house the 8MP front-facing camera. The phone is expected to have a dual camera setup which may include a 13MP main camera and a 2MP secondary one for depth sensing. The device will be powered by an octa-core CPU clocked at 1.95 GHz. In addition to that, the chipset will be paired with 4GB of RAM and 64GB of internal storage. Furthermore, it will also support microSD card expansion of up to 256GB. A massive battery of 3,935 mAh will keep the lights on. It will come with Android 8.1 Oreo straight out of the box. Moreover, it will come with Vivo’s FuntouchOS on top. The other phone with the model number V1814T was also spotted on TENAA. It features a bigger 6.41-inch display with a higher resolution of 1080 x 2340 (FHD+). Its battery size is expected to be 3,330 mAh. The dual camera setup will include 12MP + 5MP cameras. There are still no words by the company about these phones yet. Let’s see what comes next about them.